RSVP has been active in Washtenaw County since 1973. Catholic Social Services of Washtenaw County has sponsored the program since 1989. 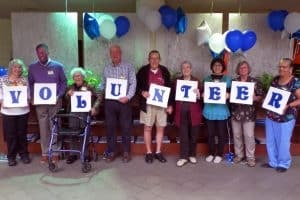 In Washtenaw County close to 300 senior volunteers serve approximately 50,000 hours annually, through 40 local nonprofits. This is the equivalent of investing $1,207,000 (based on the Independent Sector rated value of a volunteer hour) into the community. This program helps adults age 55+ contribute their talents and experience to serve local nonprofits. RSVP considers the skills and interests of each volunteer along with the needs of the partner organizations to match up the volunteer. Mentoring Youth in school programs and so much more! Volunteering can improve one’s health by lowering risk of health related problems (e.g. Alzheimer’s disease); prevents isolation and depression and promotes an active lifestyle with involvement in one’s community.